A while ago I wrote a post on Measuring Online Display Advertising. Continuing the theme, in this post I am describing 23 metrics for measuring email marketing. Get this article as an eBook at Global Analytics Academy. Sent: The numbers of emails (generally unique email address) that were sent. This number excludes any suppressions that occurs due to business rules, privacy compliance etc. Your email service provider (ESP) will have these number as a standard metrics in their reports. This is a raw metrics that is used to calculate other email performance metrics and is generally of low value by itself so should not be used as a Key Performance Indicator (KPI). A trending of this metric overtime can provide you a view into the health of your marketing list. Delivered is a count of emails that made their way into the recipient inbox. If an email was rejected by the recipients email provide then it is not counted as delivered. If an email shows up in junk folder, it is still counted as delivered. Your email service provider will have these number as a standard metrics in their reports. This is a raw metrics that is used to calculate other metrics. A trending of this metric overtime can provide you a view into the health of your marketing list. Delivery rate (described below) is a better indicator of Delivery issues than the raw number. This metrics by itself is not a KPI but forms a basis for other KPIs. Delivery Rate – It is calculated as Emails Delivered divided by Emails sent, expressed as a percentage is Email Delivery Rate. Delivery Rate measure the quality of your email list, goal is to have 100% delivery rate, but I can guarantee that it is not going to happen. Any deviation from 100% should be investigated to see what is causing the issues. If there are some hard bounces (see below) then those should be removed promptly. Too many hard bounces can lead to spam triggers and further delivery issues. Bounce – An email is considered a bounce when it cannot be delivered to the intended email address. There are two types of bounces – Hard Bounce and Soft Bounce. Hard bounce generally means that the email address is wrong or no longer exists. Soft Bounce generally means that the addresses exists but either the inbox is full or is having temporary issues, the message is too large to deliver etc. You should immediately remove Hard Bounces from your email list since they are dead and you will never be able to deliver an email to them. Raw number of bounces should not be used as a KPI. Any recipient who have disabled the images will not be counted in the open metrics since the invisible pixel won’t be loaded. Any recipient who has preview pane open will be counted as open as the emails gets loaded in preview pane enough though the person might not actually open it. Multiple views by same respondent will increase the open count, one for each view (open). Unique Opens - This measures the number of unique recipients who opened the email. Unlike Total opens, multiple views (opens) by a same recipient will be counted as one unique open. Total Open Rate – This measure the effectiveness of your subject line and your brand (shown in from column of email) in driving people to open the emails. Email open is the first action by user in their journey to engage with your email. This metrics is calculated as Total Opens divided by Delivered, expressed as percentage. Total Clicks or Clicks - Total number of clicks on any link in the email is counted in this metric. Keep in mind that a click does not mean that a person landed on the intended destination of the link hence you will likely see a discrepancy in this metric, as shown by your ESP, and the number shown in your Web Analytics tool. There are multiple factors that could lead to a click but not a visit to the destination. If one recipients clicks on multiple links then each click is counted in this metric. Unique Clicks – Unique Click counts the number of unique recipients who clicked on one or more clicks. Unlike Total Clicks, Unique clicks counts each person only once, no matter how many links that person clicks. Click to Open Rate – It measures how effective your newsletter content is in driving people to take actions. It is calculated as Unique Clicks divided by Unique Opens, expressed as a percentage. Total Click Through Rate – It is calculated as Clicks divided by Delivered, expressed as a percentage. If a person clicks on 2 links then the number of clicks will be 2. Considering that one person (email recipient) can click multiple links in the email, this number can potentially go over 100%. Unique Click Through Rate – It is calculated as Unique Clicks divided by Delivered, expressed as a percentage. Even if one person clicks on multiple links, only one click is counted in this calculation. Keep in mind that if someone talks about Click through Rate then they are referring to this metrics. This is also used for industry benchmarking by various vendors. Email Conversions – Email Conversion is defined as the count of action that you want the visitors to take when they arrive as a direct result of a click on the email. Some examples of conversions are – purchase, download a whitepaper, sign up for an event etc. Unsubscribes – Number of emails recipients who chose to unsubscribe from your future mailings. This number is available in your ESPs report. Unsubscribe Rate – Unsubscribes Rate is calculated as Unsubscribes divided by Delivered and is expressed as a percentage. It measure the effectiveness of your email marketing strategy and the quality/relevance of your email marketing. If this number continues to rise, you have a problem that should be immediately fixed. 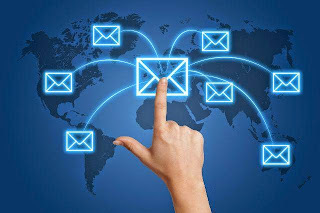 The fixes range from adjusting the email frequency to increasing the relevance of the message. Email Complaint Rate/Spam Complaint Rate – Number of emails complaints divided by total emails delivered, express as a percentage. List Growth Rate – Measures, how fast your email list is growing, it is the net results of new subscribers minus the unsubscribes and email/spam complaints. You have to make sure that your list continues to grow rather go in negative direction. Growth (new subscribers – unsubscribes- email complaints) divided by total list size is your growth rate. Your email marketing program depends on List Growth so watch this number closely and take actions to actively grow your email list. Forward Rate/Share Rate – This measures the emails forwarded (shared) by your recipients to their friends/contacts. It is calculated as number of forwards divided by number of emails delivered and is expressed as a percentage. It provides a view into the effectiveness of your email in not only engaging your recipients but also driving new subscribers, people who become of your brand as a results of receiving emails from their friends. This number is available in some ESPs. Revenue Per Sent – Revenue attributed directly to the email divided by number of emails sent. This is also sometimes expressed in terms of Revenue Per 1000 (RPM). Revenue Per Click - Revenue attributed directly to the email divided by number of unique clicks. Revenue Per Open ­ - Revenue attributed directly to the email divided by number of unique opens.Revenue numbers won’t be available in your ESP but can be tracked in Web Analytics tools for online sales. CPM – CPM stand for Cost Per Mile (1000 in Latin). This is generally used when you rent/buy emails list from third parties. It is the cost of renting 1000 email address and is calculated as (Cost/Emails)*1000. This rate should be provided to you by the vendor from whom you are renting the list. If not provided then you can use the above calculations. One costly email mistake that you can easily fix Growing email list is a hard job. All you Growth hacking goes down the drain when you make a simple mistakes that costs you subscribers that you just gained. This posts you one such mistake and how to fix it. Email Personalization Not Working? Read This This posts explains why the email personalization might not work. The bottom line is that you have update your personalization criteria over time and test it. 3 Techniques for Expanding your Email Reach Email marketers are facing a tough time with growing emails remaining unopened and unsubscribes. Acquiring new subscribers using old techniques is expensive. In this post I have listed 3 techniques that you can use to spread the word of your emails/newsletters beyond the email list that you are sending the emails to. Are You Depleting Your Email List? Email marketers, in order to maximize short term conversions, often bombard irrelevant emails in subscribers inbox However this short term mentality results in erosion of long term viability of their email marketing, due to increase in unsubscribes causing depletion of email lists. 15 Things to Test in your Email Campaign This post talks about 15 things you can test today. Targeting Cart Abandonment by Email Targeting Cart Abandonment is a great way to drive conversions however, use incentives/offers cautiously. Conversion Tip: Making the Most of the Email Confirmation Thank you Page Use your Confirmation page effectively, this posts shows an example of a good page and a not so good page. Number One Email Marketing Mistake Number one mistake marketers make with email marketing is to send “Irrelevant” messages to their customers. Find out why this strategy has a far-reaching impact on your email marketing program. 7 Ways to Create Relevancy in Emails 7 tried and tested ways of creating relevancy in emails are described in this post. Relevancy Matters in Email Marketing This post shows an example of an email that missed the opportunity to convert. 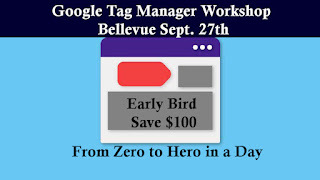 I will be conducting a full day Google Tag Manager Workshop in Bellevue (Seattle), Come and learn how Google Tag Manage works and how you can start it to use it for your business. After this class, you will know how to confidently use Google Tag Manager and deploy Google Analytics and Facebook pixel. 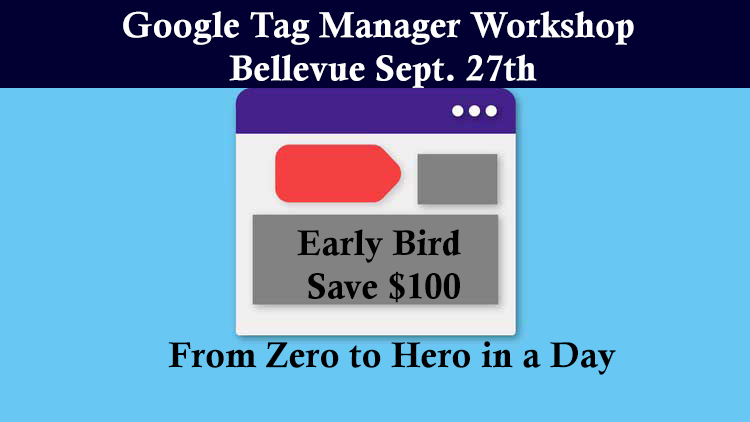 This is a great opportunity for you to remove your fear of Google Tag Manager, and get trained so that you can use it with confidence. What will this training cover? This course will cover every thing you need to know to start using Google Tag Manager with confidence. Covers the latest version of Google Tag Manager (2018). I am very confident that you will love this course. Troy – AWESOME COURSE! I bought like 4 courses (including stuff for google tag manager) on udemy to teach me this and NOTHING came close to what Anil delivered in this course! I don't usually rate courses and place comments but I will make an exception in this case. Phenomenal class, covers everything, & well worth the money! Kate Proyka – The course is well structured, clear and covers all elements of the tool. There are several examples which can be easily implemented and make sense. Bryan Bloom – I already love love this course. It is at the correct speed and amount of explanation. I was so scared of GTM and now I am learning it and loving it!! !